They went up on the roof today to do some inspecting and make sure everything was okay up there. Kon-do is a rather tall building, there is no way I would want to go up on the roof, but fortunately I wasn’t the one who needed to go up to do anything! Sounds like there weren’t any problems, and even though those of us on the ground were trying to avoid the very hot sunlight as we watched, apparently it was relatively cool up there. The rainy season has just begun, but there are still a few sunny days now and then! 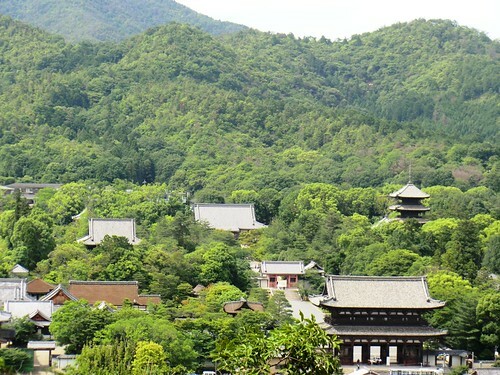 This photograph was taken from behind Kon-do after the rain cleared one afternoon. You can grab a fortune or “omikuji” near Kon-do. 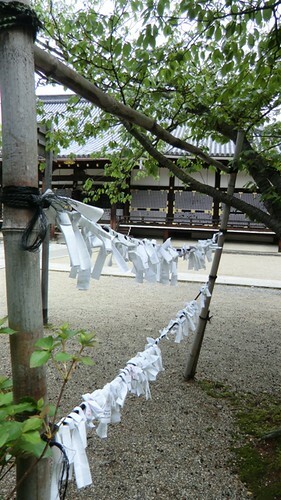 If you end up with a good fortune, you can keep it with you, but some people tie their fortunes whether good or bad to a tree, or in this case metal wires like those above, and leave them at the temple. 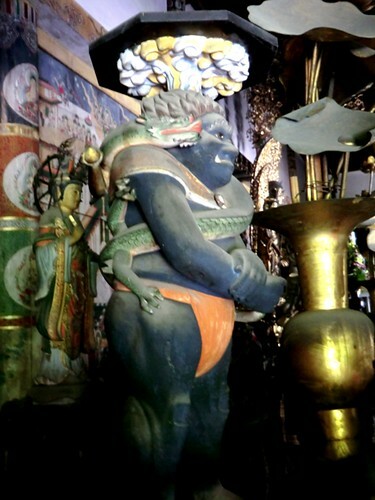 It is generally considered better to tie a bad fortune to the specified place at the temple rather than carry it around with you. 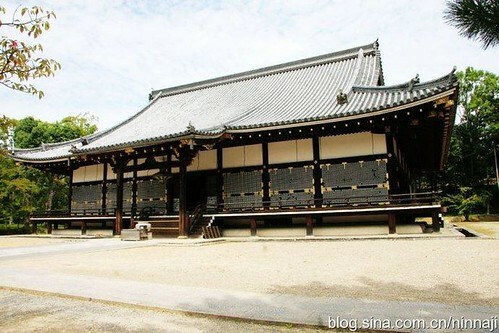 I mentioned Kon-do in an earlier post about hajitomi (the distinctive lattice shutters on Kon-do, Shinden, and Mie-do), but today I will be offering more background on the main hall of the temple. 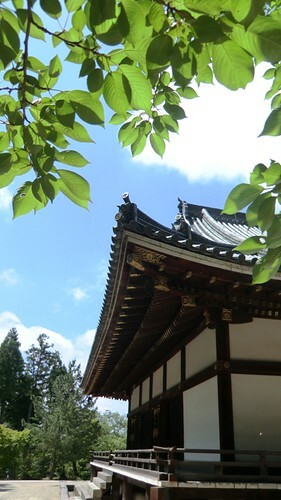 Originally built in 1613, Kon-do served as a hall for state ceremonies (shishinden 紫宸殿) at the imperial palace. 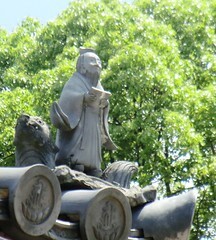 In the 17th century Kon-do was given to Ninna-ji during the reconstruction of the temple. Kon-do was taken apart at the imperial palace and reconstructed on the temple grounds during the Kan’ei Era. 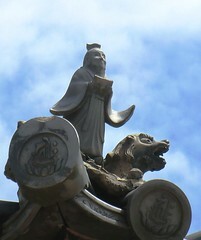 The temple’s principle image of Buddha, the Amida Triad (Amida Buddha and two attendant deities) made by Unsetsu was enshrined within Kon-do in 1644, the same year construction was completed. 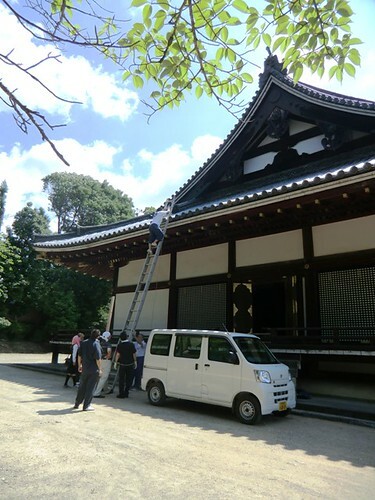 There were relatively few changes made to the building during its reconstruction; the shingle roof was replaced with tiles and an altar was constructed inside, but other aristocratic architectural elements such as the latticed shutters (hajitomi) remain. Kon-do is 12.6m (41.3ft) across and 9m (29.5ft) deep with a hip-gable roof. 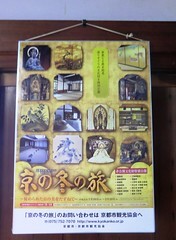 As the oldest building of its style still in existence today, Kon-do has been designated a national treasure of Japan.